It is the Year of the Dog (1946), the war is over and China is no longer an occupied country. In Chungking (now Chonqing), members of the House of Wong are preparing to celebrate Chinese New Year when a letter arrives from Brooklyn, NY that will change the life of Sixth Cousin AKA Bandit and her mother forever. And so as the Year of the Dog became the Year of the Boar (1947), Sixth Cousin Bandit beomes Shirley Temple Wong and soon she and her mother were sailing off to their new life. Arriving in Brooklyn, Shirley finds herself living in a small third floor apartment. And it wasn't long before she is enrolled in P.S. 8, regretting that she hadn't bothered to learn any English from the records her father had sent from America as her mother had done. Confused and anxious, Shirley is put into Mrs. Rappaport's 5th grade class. She begins be feel very lonely and isolated because she doesn't know English or American games and no one really wants to play with her once they discover that. When her father buys her roller skates, roller skating proves harder to do than she had expected and she gives it up. When Shirley proves to be a poor stickball or stoopball player, she is left out of the game. One day, she gets into a fight with Mabel, the tallest, toughest girl in class, but Shirley stands her ground despite two black eyes. Seeing her eyes, her parents insist on reporting it to the police, but on the way, Shirley notices Mabel is following them and she determines to say nothing about the fight. Impressed by Shirley's silence, Mabel takes her under her wing and teaches her how to roller skate, and play ball. And she introduces Shirley to the thrill of the Brooklyn Dodgers and Jackie Robinson, the first African American baseball player to play in the major leagues. Though no without its trials and tribulations, Shirley life has definitely taken a turn for the better. But there is a big surprise in store for her before the Year of the Boar comes to an end. Though this novel may feel a little dated, it remains a wonderful story for any young reader who may also be an immigrant to the US. It is, after all, a tale of coming to terms with two cultures - that of your own and that of your adopted country. And to her credit, Bette Bao Lord has really captured some of the difficulties involved in adjusting to a new life in a new country, showing us that it isn't always easy. Perhaps she was drawing on her own experience of coming to the US as an 8 year old. 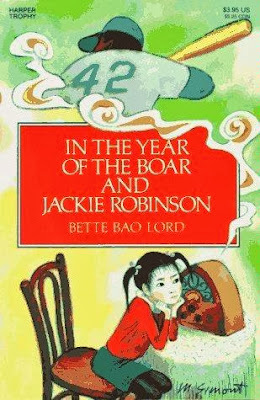 Lord does include a nice, though subtle tip of the hat to Shirley's two cultures - because this novel starts at the beginning of the Chinese New Year, the chapters are divided into months of the year 1947, with both the English word and the Chinese character given for each month. I loved her depictions of Brooklyn and the fact that Shirley goes to a public school, where she has the opportunity to meet all kinds of different kids - Latino, African American, Jewish among others. This kind of diversity was how it was when I was in school in Brooklyn and why I sent my Kiddo to public school. And the Brooklyn Dodgers - well, people were still taking about them when I was a kid even though they had long ago moved to LA. So in respect of New York, Lord did indeed get it right, but I had a little problem with what felt like a romanticized picture of China and the House of Wong. The war hit China pretty hard and Chungking (Chonqing) was very badly bombed. I seriously doubt there were family compounds like the House of Wong left. Perhaps it was done to show the difference between the two cultures that are so much a part of Shirley's life and who she is. The colorful cover and the black and white illustrations at the beginning of each chapter were whimsically illustrated by the late Marc Simont. Regardless, this is still a wonderful post war novel for young readers. A good find Alex. I think the theme is quite timeless as we see a lot of immigrant children trying to settle into new environments. Also it might be that the author wanted to focus more on the positives and post war life for Shirley?? I am curious to know if you happen to see a lot of descriptive war related narrative in books for this age group. contrast between the life Shirley had lived in China and the life she was now living in Brooklyn. And I agree that the immigrant theme is the one that is important here.